omg agree much!!! wish to publish this in newspaper and remind people to take good care of dogs!! this is a great guide! its helpful for not only considering dogs. Agreed!! A dog is like a child to you. I get very very angry when I see people abusing dogs! There is no other species who is so loyal and such a lovely companion as a dog! True that ! A Dog is true responsibility and an addition to your family. Never take him lightly !! This is such a useful guide and I think you should give a copy everywhere to make people understand that having a dog is not a game. I’ve never had a pet because I live in the very center of Rome and It would be no fair for it 🙁 even if I wish I could try that special love one day. The one in the picture up on the right is so sweet. I simply adore. I just wanted to add that every single one of those guys in your photos is awwwdorable! HUGE dog fan here! I’ve got two and treat both like family! Really good tips! Thanks for sharing! I think at the core of being a responsible dog owner, you have to love you pet as if it were family–and not just a pet. This is so important to remember! When I got Hendrix I got him from a private advert, I went to the house and all seemed fine but in the kitchen it was clear this girl had kept him locked in a cage and he was out for our benefit (He does not like small spaces even now), she had had him less than a week. I walked out with him and he was asleep in my arms before I got to the car. My mum is currently looking for a dog, taken her three years after lovely George died. The amount of people who fork out hundreds of pounds for a dog and dump them or mistreat them is heart breaking! It is hard work having a puppy. Yes great fun but hard work. I hope your post gets through to people Agata and less puppies are abandoned or abused next year. 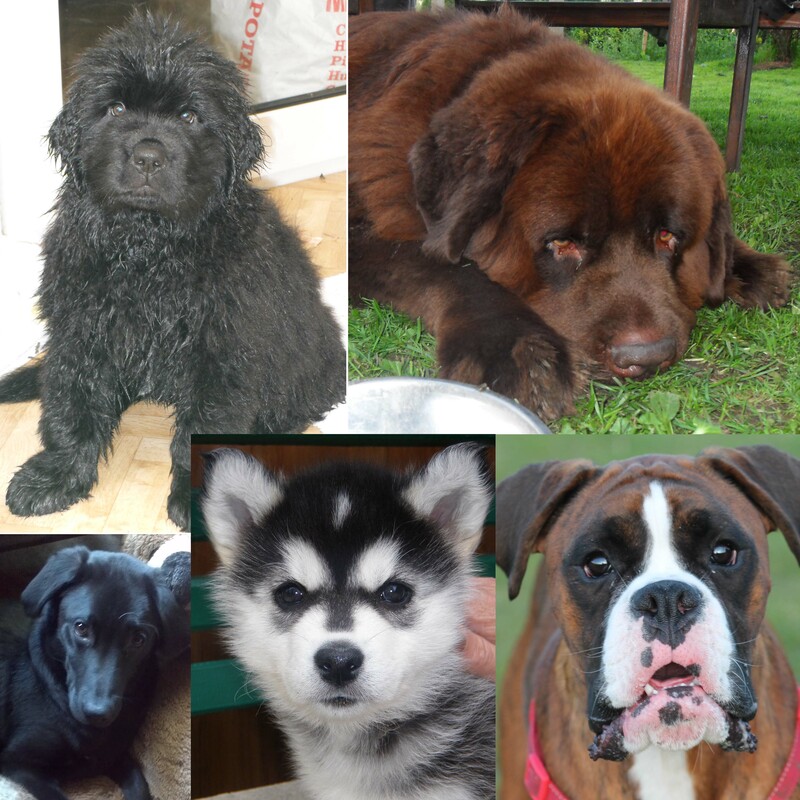 When we were looking for a Newfie pup I was really surprise how much they cost, but now I am glad that dogs are so expensive… the cost of pup itself might stop some people from getting it just for the sake of owning a dog. Hopefully that is true! It seems people just don’t consider what it takes to have a dog, let alone a puppy. Excellent post, Responsible breeders also would never let you take a puppy home immediately, it needs socialization time with his litter mates. And I absolutely agree and have actually written a few posts myself about this recently. Don’t go and buy a herding dog or a sled dog that likes to work all day but you like to sit on the couch all day.. then get a low level energy dog. And yes, a major red flag is when you go to a “breeder” and there is not at least one of the parents present of the puppies. That is a major puppy mill alert. And another tip, Christmas is a horrible time to buy a puppy because you are most likely impulsive, but also… it is most likely cold outside and puppies pee a LOT.. if you don’t want to entirely hate the housebreaking process you better buy your puppy during spring or summer when you will not hate going outside every 30 minutes… because that is what it will be at first if not more.. every 30 minutes. A lot of people romanticize getting a puppy. And it is a VERY nice experience… it also asks dedication and time and most of all endless patience! Great tip. My 7 year old keeps pestering us for a dog. We don’t think we’re ready for one yet though because of the work involved. I really agree with what you said. Pets need to be cared for. You can’t just buy them give ’em away once you can’t handle the responsibility. That’s wrong! They are a man’s best friend, one of the best companions. It saddens me when people get a “puppy” because it is cute and have no idea all being a dog owner entails. A good read to anyone wishing to get a new pet. Great post! I know so many people that get a dog…and the they dont want them anymore, and my mom keeps them all! hahahaha. I am so glad people like your Mum exist… dog fostering is becoming a huge thing. Big Thank You to your Mum and others willing to help. I have a dog and this is great advice! I think people often times rush into it without thinking about the best fit for your family and even if you are up to the responsibilty of having a dog, because they are work! Thanks for the post. My hubby and I always go back and forth about this issue. We live in an apt too small to house a big dog as he wants a boxer. I also know that I would be the one that has to walk, feed and bathe it and that is where I put my foot down. I love dogs but right now is not the right time for one. It is worth waiting in order to get it right. If more people took your advice I wouldn’t have had to foster 20 dogs in the past 4 years, as much as I loved them I would have preferred them to have happy lives in their first homes. Thank God for people like you Mick, I am so happy to know that good people still exist and are willing to help. Great post especially the tip about checking your finances. Dog food, trips to the vet and paying for puppy damage really can add up.